Conjunctivitis, also known as "pinkeye", is an inflammation of the conjunctiva, the thin, clear tissue that lies over the white part of the eye and lines the inside of the eyelid. Conjunctivitis caused by some bacteria and viruses can spread easily from person to person, but are not a serious health risk if diagnosed promptly. Redness in the white of the eye or inner eyelid. Increased amount of tears. Thick yellow discharge that crusts over the eyelashes, especially after sleep. Green or white discharge from the eye. See your eye doctor if you have any of these symptoms of conjunctivitis. He or she will conduct an exam of your eyes and may take a sample of fluid from the eyelid using a cotton swab to be analyzed in a microbiology lab. Bacteria or viruses that may have caused conjunctivitis, including a sexually transmitted disease or STD, can then be identified and proper treatment prescribed. The treatment for conjunctivitis depends on the cause. Bacteria. Conjunctivitis caused by bacteria, including STDs, is treated with antibiotics, in the form of eye drops, ointments, or pills. Eye drops or ointments may need to be applied to the inside of the eyelid three to four times a day for five to seven days. Pills may need to be taken for several days. The conjunctivitis should improve within a week. Take the medicine as instructed by your doctor, even if the symptoms of conjunctivitis go away. Viruses. This type of conjunctivitis often results from the viruses that cause a common cold. Just as a cold must run its course, so must this form of conjunctivitis, which usually lasts from 4 to 7 days. Irritants.For conjunctivitis caused by an irritating substance, use water to wash the substance from the eye for five minutes. Your eyes should begin to improve within four hours after washing away the substance. If the conjunctivitis is caused by acid or alkaline material such as bleach, call your doctor. Allergies. Allergy-associated conjunctivitis should improve once the allergy is treated and the allergen removed. See your doctor if you have conjunctivitis that is linked to an allergy. 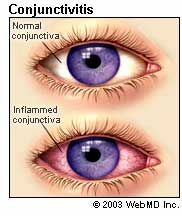 What Can I Do to Relieve Symptoms of Conjunctivitis? Avoid the use of makeup. Non-prescription "artificial tears," a type of eye drops, may help relieve itching and burning from the irritating substances causing your conjunctivitis. However, other types of eye drops may irritate the eyes and should not be used. Note: Do not use the same bottle of drops in an uninfected eye.